JetPens recently sent me two Uniball Jetstream pens to try. One from their inexpensive Rubber Body series and the other from their pricier Alpha Gel Grip series. Both pens feature special Jetstream ink which Uniball claims dries 9 times faster than standard ballpoint ink and is fade and water resistant. Note: Click the images in this review to see a larger view. This is an inexpensive pen ($4.25) that is available in 3 colors: Orange (shown above), Black and Silver. 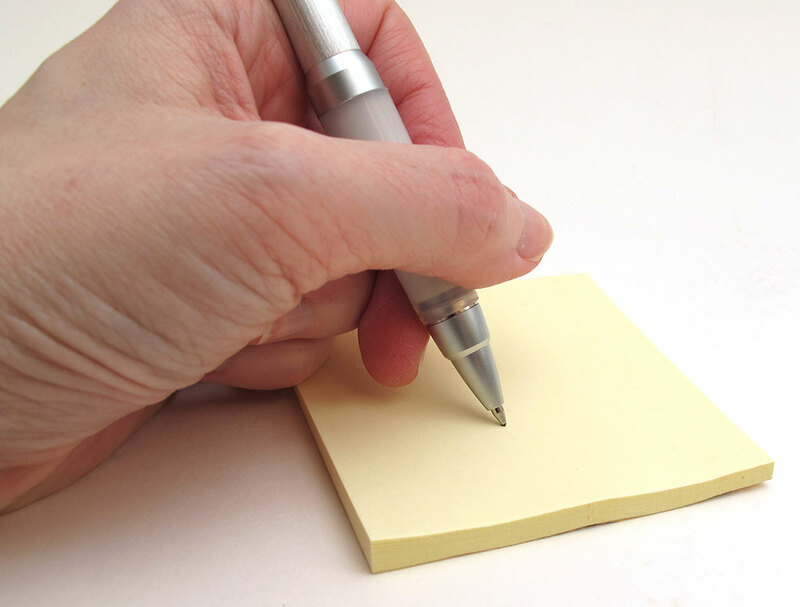 The body of the pen is made of rubber coated plastic, which gives it a nice grip, but provides no real padding for your fingers. 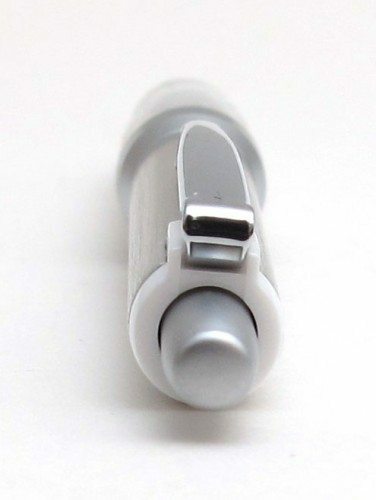 This Uni-ball is a retractable pen with a nice firm click cap on one end. I think the cap is made of aluminum, but I can’t be 100% sure. It has a dark “bubble” in the center of the cap which provides an interesting decoration. The opposite end where the tip protrudes, also looks to be aluminum, but I’m pretty sure it’s just plastic. There are 4 windows around the barrel that allow you to see your ink level. 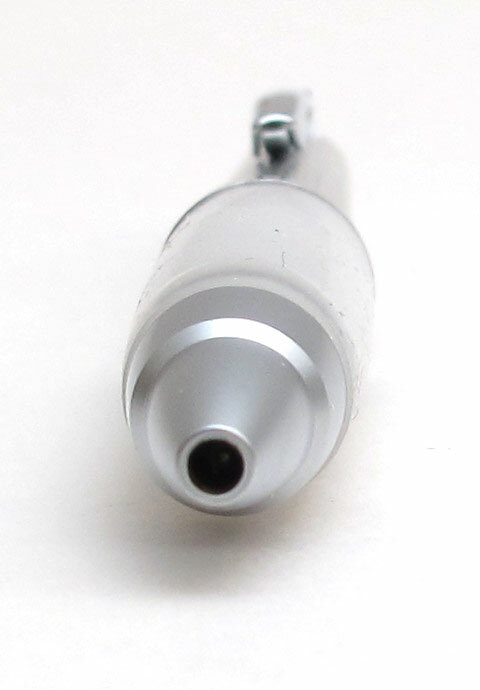 The pen ships with a 0.7mm fine Black ink cartridge. Refills run $1.55 and are available in Blue and in a 0.5mm Black version. Writing with this pen is comfortable. It’s light weight, but still offers good balance. What I really love though is just how smooth it writes. 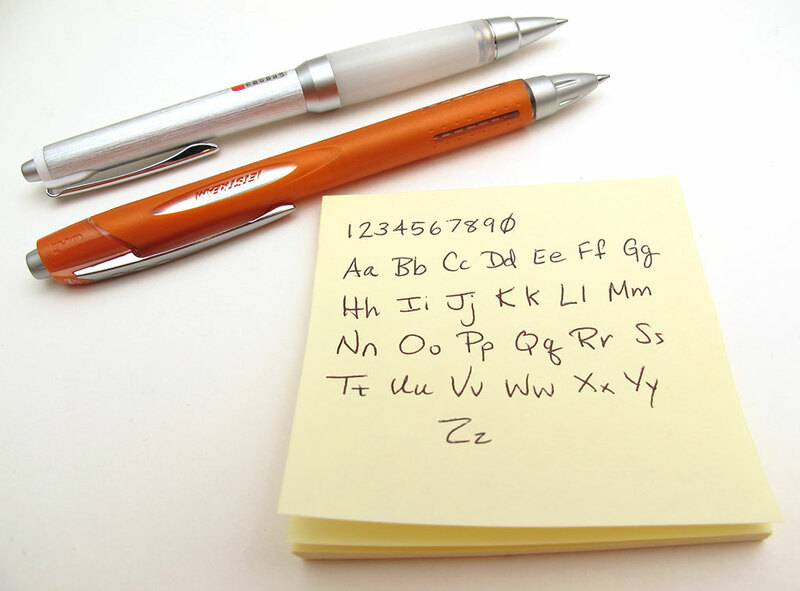 The ink flows out effortlessly making it almost feel like you’re writing with a fine tipped marker. With a price tag of less than $5 and the ability to refill it, this might be my new favorite every day pen that I won’t cry (too much) over if I lose it. This Uni-ball pen uses the exact same refills as the less expensive Rubber Body pen reviewed above. But this one has a classy brushed aluminum body and a gel grip that provides a lot of comfort. Silver, Black, and Pink body colors are available. The top has a clicky metal cap. And the other side has a screw on metal tip. The only gripe I have about the grip (try saying that three times fast) is that dust has a tendency to stick to it in the same way that dust sticks to silicone phone cases. 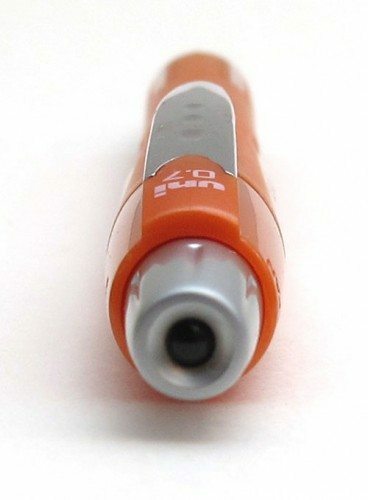 This pen ships with a 0.7mm fine Black ink cartridge. Refills run $1.55 and are available in Blue and in a 0.5mm Black version. Both pens provide the same writing experience as far as the tip and inks. As advertised, they dry fast and barely smudge even when I tried immediately after writing something. As a lefty, I often get ink on the side of my hand from going through the ink as a write. I’ve not had this problem when using either Jetstream pen because the ink dries so quickly and doesn’t smudge. 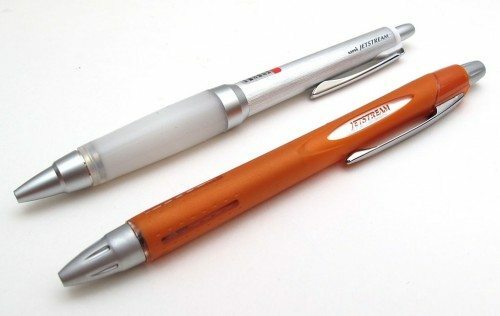 I have enjoyed writing with these pens and have no problems recommending both the Uniball Jetstream Rubber Body series and the Jetstream Alpha Gel Grip series pens as great everyday writing instruments. If you write a lot, I’d go with the Alpha Gel Grip for the added comfort. Otherwise, the Rubber Body Series is just fine. I would like to comment on your photographic skill. The photos are professionally done, to the point that people don’t notice them, which is a good things. I read website reviews often and one of the things that hit me right away is the quality of the pictures, or lack thereof. As for pens, my current darling is the Cross Edge Capless Gel Ink Pen, in Octane Green color. But, I would like to try the Jetstream for comparison. Thank you for a good review. @Hai Vu Thank you very much for the compliment on the pictures. I’m going to have to check out the Cross Edge now! I am left-handed and I note from the photos that you are a lefty too! 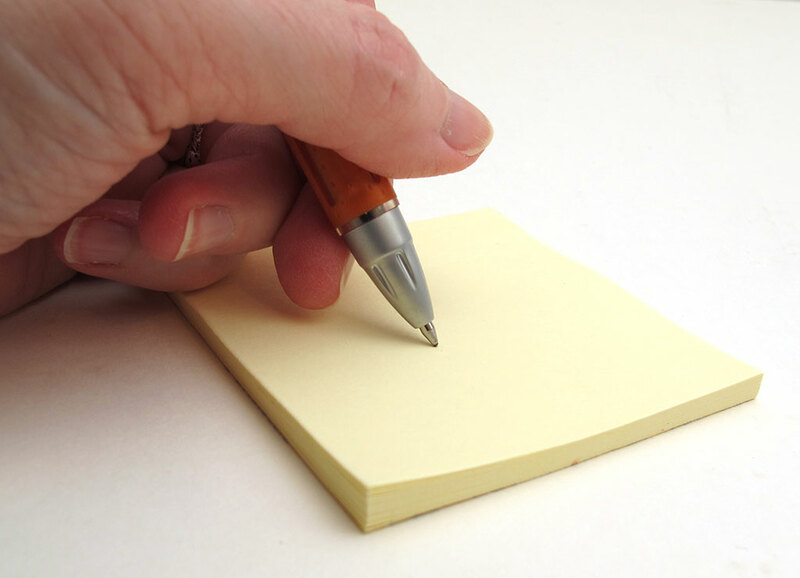 With some pens, I would get an ink smear on the side of my left hand whenever I use a pen for a while. How is the ink from these pens in regards to smearing hands? No smear? Some smear? Lots of smear? @PE Yep, I’m a lefty 🙂 I’m happy to report that the special Jetstream ink cartridges dry very quickly and do not smear. No ink on the side of your hands – at least I haven’t noticed any. I don’t think I have ever seen such a detailed article about pens and their ink 🙂 Especially the photos! I remember when I bought a pack of jetstream (the basic RT kind) a few year ago, they had the metal tip. I liked the heavier metal tip. A little late to the party, but I love my Jetstream RT, which appears to be the same as the “Rubber Body” series you review. However, it should be noted that this particular model of Jetstream is limited to a black body with black or red ink, or a blue body with blue ink. And refills are limited to the 1.0mm tips. Glad I read this review, as it has enlightened me to JetPens,where I’ll have to start looking for 0.7mm or 0.5mm refills for my US Jetstreams! Sorry, meant to add this this particular model is limited to three ink colors and 2 body colors in the United States. I have over 10 of these not working properly. Either it is faulty batch or whatever. It is like 10% chance to work properly. My first one worked fine and no problem until empty. Others although having extreme care stopped working within day 1-2.Had luck after buying 3 of them. After that all others dont work. You got me hooked on the Jetstream pens, Julie. I’m fussy about pens, and find the Jetstreams to be just as you described. Uniball jet Pen is most faster and comfortbale for writing than normal jet pen and i want to buy this pen as soon as possible. Thank you sharing all important details about Uniball Jetstream . 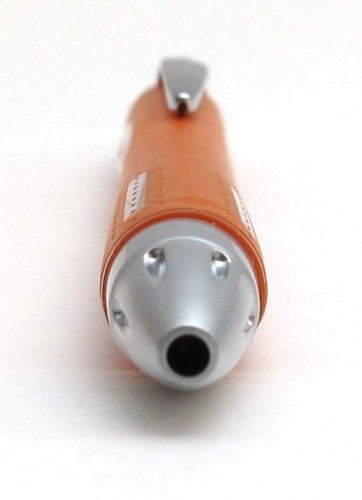 I want to buy this pen tomorrow .